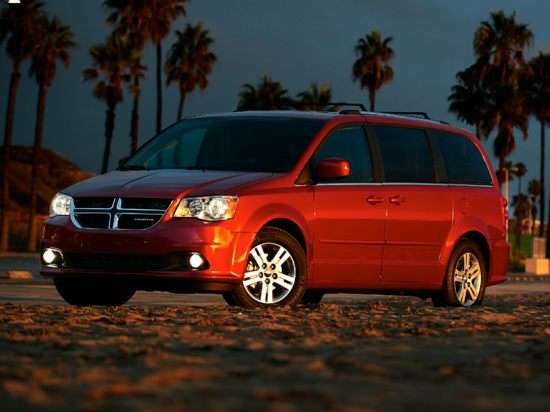 Dodge pares the 2014 Grand Caravan lineup down with the cancellation of the Crew trim level. A sporty Blacktop Package is available for the SE and SXT models, and these trim levels can also be equipped with a 30th Anniversary Edition option package commemorating 30 years of Dodge minivan production. The sport-tuned R/T models add automatic headlights and remote engine starting as standard equipment for 2014. With the cancellation of the Crew model, the 2014 Dodge Grand Caravan lineup includes the American Value Package (AVP), the SE, the SXT, and the R/T. Choosing the SE trim level adds standard second- and third-row Stow ‘N Go seating, triple-zone automatic climate control, additional stereo speakers, a front console with cupholders, and body-color exterior trim combined with dark tinted rear privacy windows. The Grand Caravan SXT is equipped with power sliding side doors, a power rear liftgate, power second- and third-row windows (vent only in third row), and power adjustable pedals. A Super Center Console design is also standard, along with heated side mirrors. The R/T model is the sporty version of the Grand Caravan, equipped with 17-inch aluminum wheels, revised suspension tuning, leather seats, an upgraded audio system, and a monochromatic exterior treatment. Every 2014 Dodge Grand Caravan is equipped with a 3.6-liter V-6 engine generating 283 horsepower. A 6-speed automatic transmission powers the van’s front wheels. In combined driving, the 2014 Grand Caravan is rated to get 20 mpg. Stick to the city, and it gets 17 mpg. Drive on the highway, and the estimate is 25 mpg and a range of 500 miles. According to the National Highway Traffic Safety Administration (NHTSA), the 2014 Grand Caravan receives a 4-star overall crash-test rating. The Insurance Institute for Highway Safety (IIHS) has not assessed the 2014 Grand Caravan’s crashworthiness as this overview is written, but in 2013 this model received a “Top Safety Pick.” Note, however, that the IIHS has not subjected the Grand Caravan to its new small overlap frontal-impact test. All versions of the Grand Caravan are available with Uconnect Bluetooth connectivity, and except for the Grand Caravan AVP, all can be optioned with a reversing camera. A Safety Sphere Group is reserved for the SXT and R/T models, and contains rain-sensing wipers, parking sensors, a blind-spot information system, and Rear Cross-Path Detection technology. Dodge also provides a choice between two rear-seat entertainment systems, each paired with a touchscreen infotainment system that includes a 40GB music server hard drive, a 115-volt power outlet, HDMI video game input jacks, dual USB charging ports, wireless headphones, and a remote control. Upgrade to the Blu-Ray version, and it includes viewing screens for both the second- and third-row seats. A navigation system is also optional for the Grand Caravan SXT and R/T, and these models can be fitted with the touchscreen radio separately from a rear-seat entertainment system.